We have already seen procedure to upgrade Hotmail to new Outlook email account. New @Outlook.com email account has completely new and different user interface design as compared to older Live Hotmail inbox. If you are fan of minimalistic metro user interface (as seen in upcoming Windows 8 OS), then moving from Hotmail to new Outlook email will be more than a welcome change. 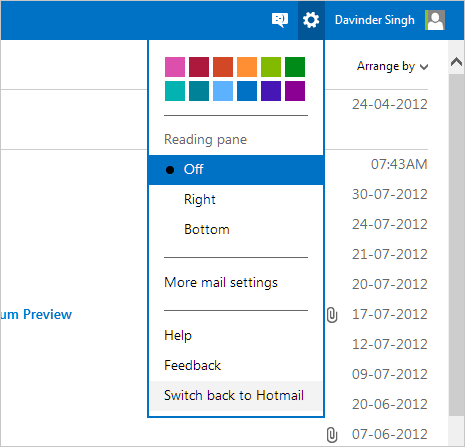 However, few users may not like the simplicity of metro inspired interface of new Outlook.com email. 1. Fortunately, Microsoft has provided option to switch back to old Hotmail design – just in case you hate new Outlook email design interface. Login into your new Outlook email design at Outlook.com website. 2. Click on Settings icon at right side of top navigation bar. Then click ‘Switch back to Hotmail’ option. 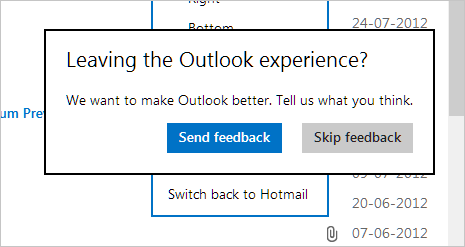 Then you should see pop-up box asking for feedback on new Outlook design. You can write your ‘not so good’ Outlook experience or click Skip Feedback button to continue. 3. Within few seconds, webpage will refresh and your inbox should appear in older Windows Live Hotmail user interface. After the switch back, there is still option to upgrade to new Outlook which can be used anytime. While in the inbox, click Options button at top right and then click Upgrade to Outlook.com option. While switch back option from Outlook to Hotmail is available as of now, it may not last for long. Microsoft is introducing metro user interface in its every product and service – it may not be long when all @msn, @hotmail and @live email accounts are automatically migrated to all new modern @outlook email user interface. Please advise how to switch back to old email format. I do not have the option revert back. HELP! I join the army of Outlook haters ! It’s so user-unfriendly, the email list is expanded twice – additional scrolling scrolling scrolling until you reach the same what you could see at the first glance, the attachment signs are somewhere on the other end of the screen – one has to look twice-thrice until detects the emails with attachments, the pale-blue colour is tiring eyes, this Outlook is just AWFUL and I am thinking of alternatives. In the 21st century, users expects improvements, not playing on their nerves. As Mick said above, some of us don’t have any options available. The icon for settings doesn’t open and we are not given any options to revert back. It’s unbelievable to loose everything that was on Hotmail. Outlook isn’t working at all for me. What if there are no control boxes whatsoever? just the outlook logo in the upper left corner. no way to access any type of control? I hate Outlook, want Hotmail back, i dont have COG sign, dont have Sign Off either.